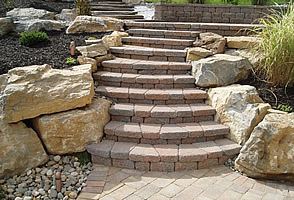 Steps are an important aspect of every project. They must fit each design properly to ensure character, flow of foot traffic, and durability. They must be done properly and are the key ingredient of craftsmanship. Many contractors fail to achieve this part of the equation, but Paverscape inc. will install them with the utmost respect for longevity. EP Henry Coventry block steps with pillars and natural flagstone cap.